Growing in Grace Podcast: 553. 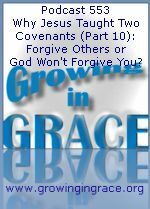 Why Jesus Taught Two Covenants (Part 10): Forgive Others or God Won't Forgive You? 553. 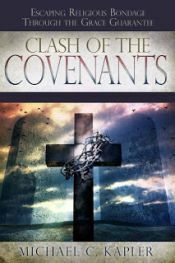 Why Jesus Taught Two Covenants (Part 10): Forgive Others or God Won't Forgive You? In part 10 of our series, we take a look at something Jesus stated about forgiveness. He said people should pray they will be forgiven as they forgive others. After the prayer, Jesus said they would be forgiven for sins based upon the condition that they forgive others for their sins. This was not good news to the Jews who were listening because it was based upon their ability instead of the gift of righteousness that would come through Christ. Jesus went on to tell them about something they were ignorant about — God's righteousness. They should begin to seek this instead of trying to establish their own righteousness through the works of the law. As believers, we no longer seek this gift because we have already become His righteousness. I'm really enjoying this series God bless you guys;keep sharing the gospel! Thanks much... we really appreciate your feedback! So glad you're enjoying the series.